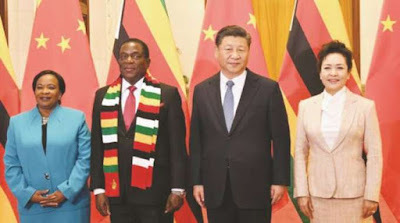 President Emmerson Mnangagwa poses for a photo with Chinese President Xi Jinping and First Ladies Auxillia Mnangagwa (left) and Peng Liyuan in Beijing yesterday. Zimbabwe and China yesterday signed Memoranda of Understanding that will expedite the country’s socio-economic recovery under the new dispensation. The Minister of Finance and Economic Development, Cde Patrick Chinamasa, signed agreements on economic and technical co-operation between the Chinese government and Zimbabwe. China’s Minister of Commerce signed on behalf of his government. The Finance Minister also signed more agreements on food assistance, the supply of high perfomance computers Phase 2, availability of experts from China in various fields and the drilling of an additional 500 boreholes to Zimbabwe. A similar figure has already been drilled with assistance from China. Foreign Affairs and Trade Minister Dr Sibusiso Moyo signed the Memorandum of Understanding on Human Resources Development on behalf of the Public Service Commission. These were signed before President Mnangagwa and his host President Xi Jinping at the Great Hall of the People here yesterday. Earlier, Environment, Water and Climate Change Minister Oppah Muchinguri-Kashiri signed an MOU on the construction of Kunzvi Dam while Ministry of Local Government principal director Colonel Joseph Mhakayakora (Retired) also signed an MOU on Harare waterworks. This will, among others, help deal with the water hyacinth that continues to choke Lake Chivero. Construction of Kunzvi Dam has stalled over the years due a myriad of reasons. Hopes are that it will be resuscitated soon following the deal, whose details were not available at the time of going to press. The agreements secured on President Mnangagwa’s current State visit here dovetails into the Government’s thrust on a foreign policy that puts more emphasis on economic growth. President Mnangagwa has said his priority is to get the economy back on track and has embarked on a re-engagement process of the family of nations. He has said Foreign Direct Investment and private sector involvement will expedite economic recovery in Zimbabwe.